The Rangers took advantage of a quick start, and wound up holding on for a 5-2 victory. Lundqvist was strong in net, making 29 saves for his fourth consecutive victory. Photo courtesy of Getty Images. The Rangers (15-10-4) handed the Calgary Flames (17-14-2) their sixth consecutive loss, and wound up extending their win streak to four games, sweeping the Western Canada road trip. The Rangers were led by the offensive outburst of Rick Nash, who scored two goals in the game to extend his point streak to 11 games. Nash’s goals gave him a total of 20 for the season, which made it 11 straight seasons for Nash with at least 20 goals, which is the NHL’s longest active streak. Henrik Lundqvist was very sharp in net. 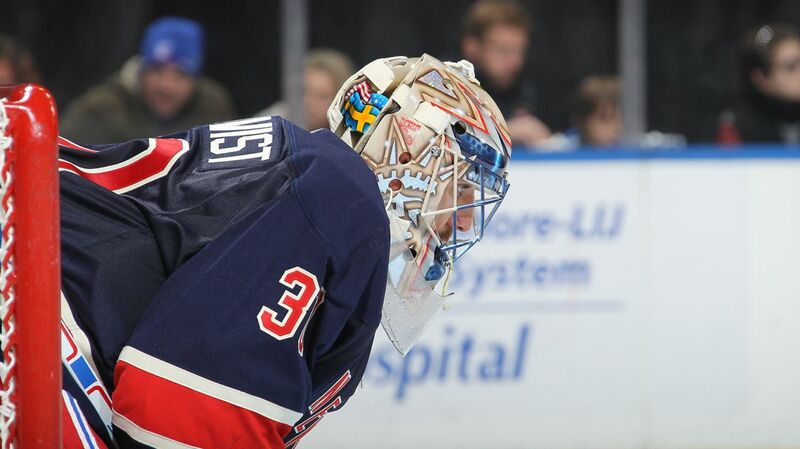 The defense in front of him was strong, but Lundqvist made 29 saves to help the Rangers extend their win streak. Lundqvist has started all four games during the Rangers win streak and has allowed three goals in the last three games. Two of the Rangers snapped scoreless streaks, with Chris Kreider snapping his 13 game streak without a goal, and Derek Stepan scoring his first goal in eight games. Chris Kreider was finally able to end his goal drought, scoring his fifth goal of the season off of a heads up power play opportunity. Kreider may have some weight lifted off of his shoulder now, and hopefully this confidence will help kick start his play. Photo courtesy of Getty Images. Karri Rmao started for Calgary, but was replaced by Jonas Hiller after allowing four goals on 13 shots. Jiri Hudler and Curtis Glencross scored the two goals for Calgary. The first period started out similar to the Edmonton game, with both of the teams playing quite reserved and patient, waiting for the other team to make a mistake. Both teams were playing very smart. Early on, the Rangers were making good plays in front of Lundqvist to either clear the puck or prevent a shot from going through, most noticeably from Chris Kreider and Marc Staal. After a while, the game began to open up a bit, and the Rangers started to get more opportunities in Calgary’s zone. The Rangers were able to strike first, and it was their leading goal scorer Rick Nash who put the Blueshirts on the board. TJ Brodie dumped the puck into the Rangers zone so the Flames could get a line change. However, Lundqvist decided to leave the puck, and it traveled all the way around the boards to a waiting Rick Nash. Nash went on a breakaway, and made a fantastic move to beat Karri Ramo, giving the Rangers an early one goal lead. Rick Nash’s used a fantastic deke to get the puck past Karri Ramo for his first goal of the game. Nash would score his 20th goal of the game on a short handed chance in the second period. Photo courtesy of Getty Images. Nash extended his point streak to 11 games, which is a career high. Nash has points in 24 of the Rangers 29 games, and has at least one point in 14 of the Rangers 15 wins. And for the one win that he did not have a point in? He scored the shootout winner against the Carolina Hurricanes on October 16th. The Rangers would get a power play opportunity shortly after the goal, and although they did not score, started to increase their pressure on the Flames. Calgary came close to tying the game, when a Joe Colborne shot was tipped by Lundqvist, hit the post, and then cleared off of the line by Kevin Klein. On the next Rangers power play, which came courtesy of a hooking call, New York did manage to score a goal. 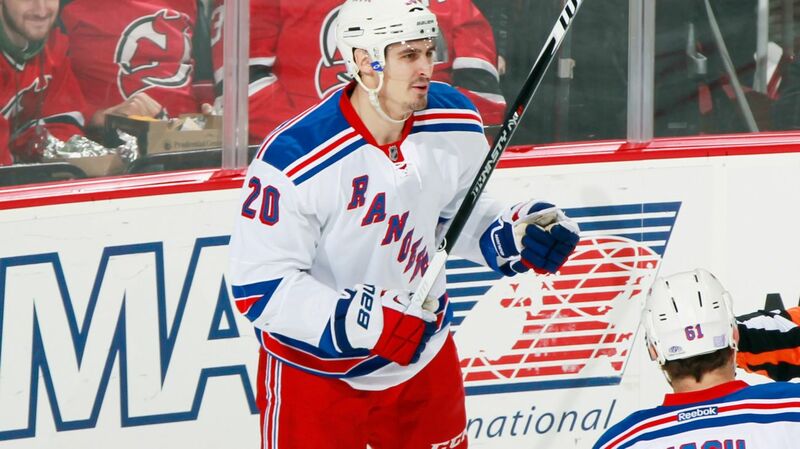 This time, it was Chris Kreider ending his scoreless drought, giving him his fifth goal of the season. Mats Zuccarello fired a quick shot at Ramo, which he saved but left a rebound. Calgary defenseman Kris Russell tried to get the puck to Ramo so he could cover it for a whistle, but Kreider never stopped skating towards the net, and tapped the puck in between the legs of Ramo to extend the Rangers lead to two. The goal came with just 16 second left in the opening period. The late goal really deflated the Flames, and the Rangers got out to a quick start again, giving them a big advantage over the struggling Calgary team. Early in the second period, Lee Stempniak was sent to the box for high sticking, and the Flames had an early power play chance. However, it was the Rangers that scored, despite being shorthanded. After Derek Stepan won the puck along the boards, Dan Girardi was able to chip it out of the zone, sending Rick Nash and Stepan on a 2-on-1. Stepan placed a perfect pass right on Nash’s stick, and he wristed one home for his 20th goal of the season. Derek Stepan had the primary assist on Nash’s second goal of the game. Stepan continues to contribute this season, and has put up 16 points in his 17 games this season. Photo courtesy of MSG Photos. The 20th of the season for Nash marked 11 straight seasons with at least 20 goals for Nash. However, he has already hit the 20 goal mark just 29 games into the season. The Flames continued to get quality opportunities, but Lundqvist was strong in net, with his best save being a right pad save on Colborne in front following a scramble. 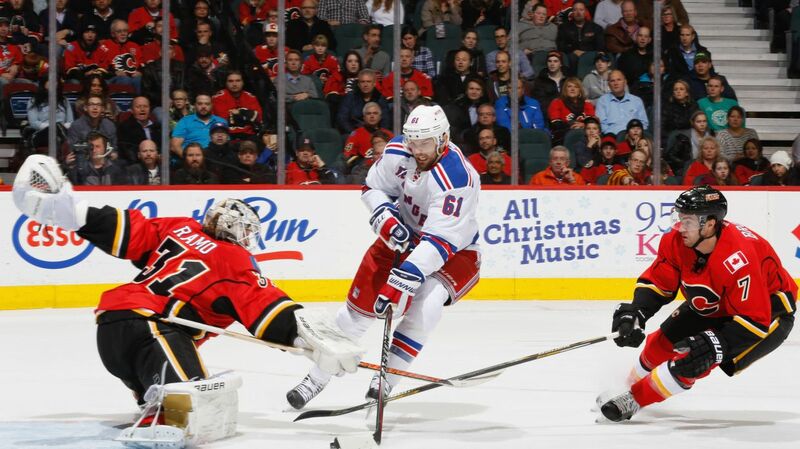 But despite the Flames outshooting New York, the Blueshirts managed to score their fourth consecutive goal. Markus Granlund of Calgary fired a shot that wound up hitting the post, nearly scoring the first goal of the game for Calgary. Martin St. Louis started up on the rush, and made a nice pass to Derek Stepan. Stepan mishandled the puck before a shot, but managed to tuck in a wraparound chance past Ramo for his first goal in eight games. The Rangers now had a 4-0 lead in the middle of the second period. After the goalie change, the Flames responded quickly. 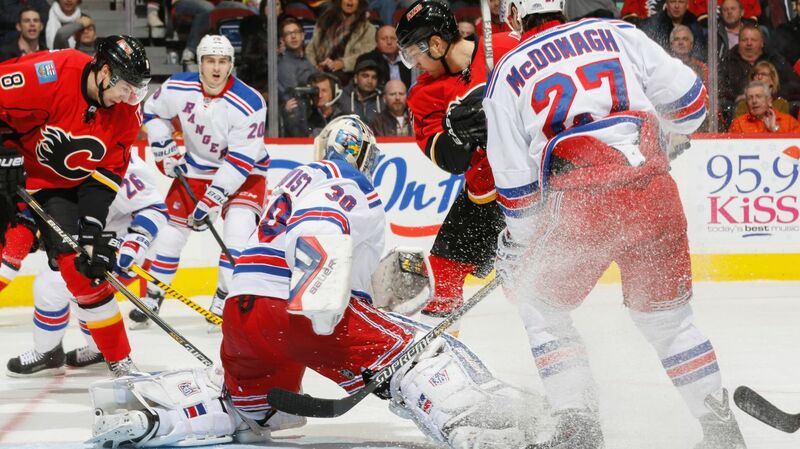 Jiri Hudler deflected a Mark Giordano past Lundqvist, putting the Flames on the board. When the second period came to a close, the Rangers had a 4-1 lead despite being outshot in the period 16-9. Lundqvist was extremely strong in the second period, stopping all 16 shots he faced. Lundqvist made 29 saves en route to his fourth consecutive win. Photo courtesy of MSG Photos. In the third period, the Rangers locked down the Flames for most of the period, prompting the Flames to pull their goalie with over 4 minutes remaining. The plan did not work, and Carl Hagelin scored in the empty net for his seventh goal of the season. The Flames would score one more goal on the power play, with Curtis Glencross firing a wrister past Lundqvist for his sixth goal of the season. But the Rangers had the last laugh, winning by a final score of 5-2. The Rangers were once again led by strong defensive play. This time, it came from the forwards and the defensemen. All of the Rangers made smart decisions in front of Lundqvist and shut down the Flames for the majority of the game. The Rangers were credited with a season-high 26 shots. 13 different Rangers recorded at least one block, and eight of them had at least two blocks. Kevin Klein led the way with three blocks in tonight’s game, but the entire team played extremely well in front of Lundqvist. Although it wasn’t a shutout, this was one of the Rangers most complete defensive efforts this season. Henrik Lundqvist is beginning to look like he has found his game. Lundqvist has only given up three goals in the last three games, and has won his last four starts. Lundqvist made 29 saves tonight, including some very tough ones. When Lundqvist is on his A game, the Rangers have a much better chance at winning. With an assist on the Carl Hagelin empty netter, Kevin Hayes extended his point streak to six games. The rookie now has 12 points (4-8-12). Chris Kreider had his best game in about a month tonight. 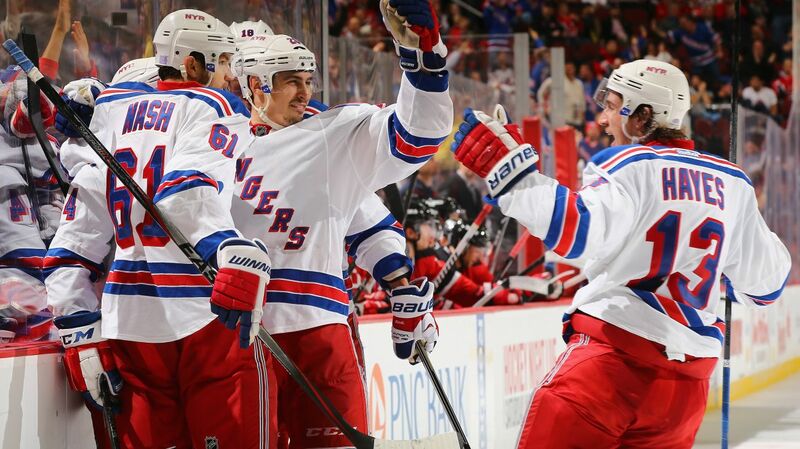 Kreider was finally able to end his goal drought, tapping in the puck on a heads up play on a power play opportunity. He was also very physical, recording three hits and blocking one shot. With the weight of scoring a goal lifted off of his shoulder, hopefully Kreider will continue to put pucks in the back of the net. 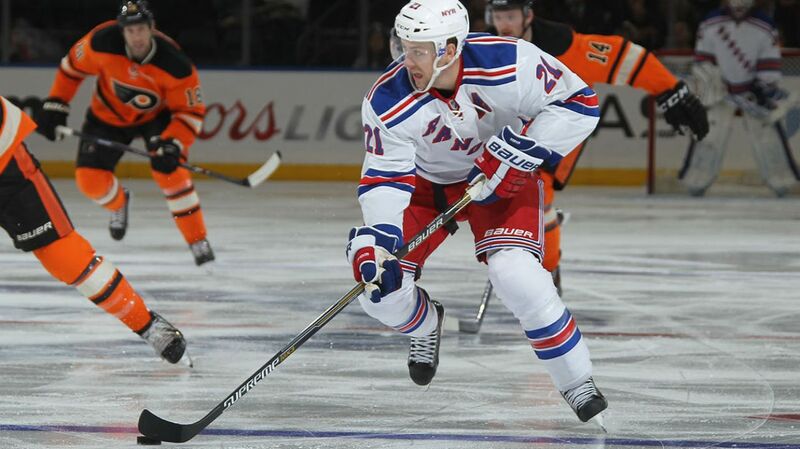 Derek Stepan had a solid game, scoring a goal and picking up an assist on Nash’s goal. Stepan has 16 points (3-13-16) in 17 games this season, and continues to play a strong two-way hockey game. Kevin Klein had another solid game, clearing two pucks off of the Rangers goal line and blocking three shots. Klein continues to be one of the best and most consistent defenseman on this Rangers team. 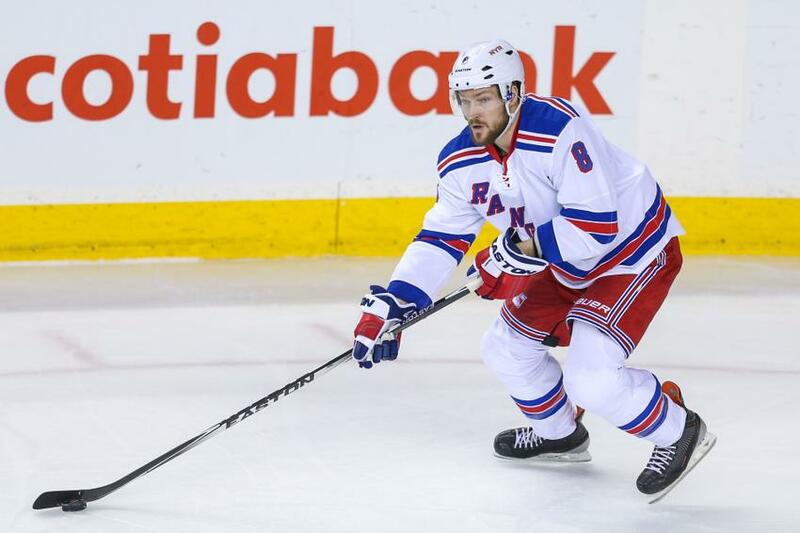 Rick Nash has been absolutely tremendous for the Rangers. Not only does he produce on offense, but he plays incredible defensive hockey. Nash constantly forces turnovers, plays well on the penalty kill, and shuts down the passing and shooting lanes. Oh, and he also has 20 goals and 32 points this season. He has been doing it all for the Rangers, and is truly the MVP of this team. Rick Nash continues to dominate throughout this season. Nash now has 20 goals this season, and leads the Rangers in points, as well as leading them on the ice. Photo courtesy of Getty Images. The Blueshirts will have off until Friday, where they will take on the Carolina Hurricanes for the start of a home-and-home. The Hurricanes have lost their last six games, and will be searching for a win at home. Posted on December 17, 2014, in Game Recaps and tagged Alain Vigneault, Anthony Duclair, Calgary Flames, Carl Hagelin, Carolina Hurricanes, Chris Kreider, Dan Boyle, Dan Girardi, Derek Dorsett, Derek Stepan, Derick Brassard, Dominic Moore, Edmonton Oilers, Eric Staal, Henrik Lundqvist, Jesper Fast, John Moore, Johnny Gaudreau, Jordan Staal, JT Miller, Kevin Hayes, Kevin Klein, King Henrik, Madison Square Garden, Marc Staal, Mark Giordano, Martin St. Louis, Mats Zuccarello, Matt Hunwick, MSG, New York Rangers, NHL, NHL 2014-2015 Season, NY Rangers, NYR, Rangers Nation, Rangerstown, Rick Nash, Ryan McDonagh, Ryan Miller, Taylor Hall, The Duke, The Ranger Zone, Vancouver Canucks. Bookmark the permalink. Leave a comment.